Uncle Mike's Sentinel Nylon Chemical Spray Pouch provides wearers with the access needed to subdue aggressive targets at a moment's notice. Ergonomically-designed to take up minimal space on a duty rig, the pouch sits snugly on the belt, unnoticed until it is needed most. A snap retention flap keeps OC sprayers secure while retaining tactical accessibility. 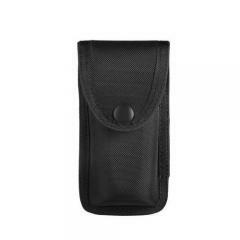 A quick flick with the finger releases the strap, allowing users to instantly deploy pouch contents. The canister pouch is constructed from military-grade, ballistic nylon for maximum durability that can stand-up to the duress of daily law enforcement use. Fits perfectly but can come unsnapped very easily. Is the medium size for the 1.8oz spray can? Yes, the medium size will fit a MK-3 (1.8-2 oz) can.